In an industry desperately seeking change and sustainable innovation, We aRe SpinDye® (WRSD) offers the apparel and fashion industry an updated way of bringing colors to fabrics – we remove the conventional dirty and inefficient dyeing process. It is time to put ‘water out of business’! WRSD is a highly innovative Swedish ingredient brand which offers a technically innovative color system for large scale fabric manufactures. WRSD delivers a clean, traceable coloring method for textiles with an unparalleled performance and long term life expectancy. 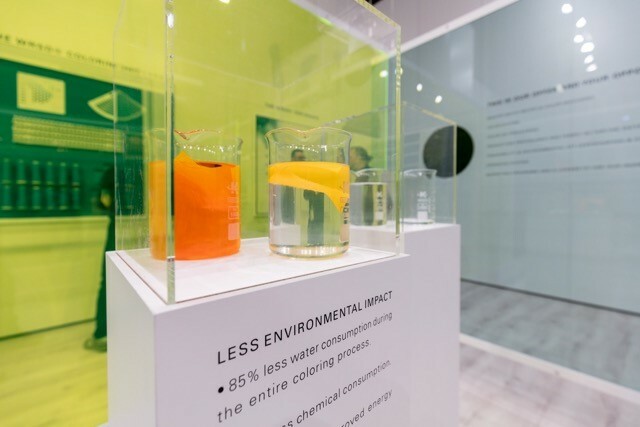 WRSD has launched a complete new standard for colouring man-made fibres that brings a very positive environmental impact in terms of water usage and production process optimization. With this initiative will deliver impact on No. 6, 7, 9 and 12 of the UN Sustainable development Goals. The textile industry is one of the world’s most environmentally polluting industries, and the colouring or dyeing is the part that has the most negative impact on our planet. A significant part of this is explained by the fact that the dyeing processes of fabric are still obsolete, analogue, and to a large extent also manual processes. Our project aims to digitise this industry, thereby providing a globally scale solution for how to produce and colour textiles in a significantly more environmentally friendly manner and provide a better resource efficiency to the producers. The total polyester market for apparel amounts to a production value of $115 billion. The global textile industry is responsible for a massive contamination of the world’s waters. The World Bank indicates that 20% of all water pollution relates to textile staining processes. We have developed and refined a new production method, the so-called SpinDye®-method, for colouring synthetically produced fibres, focusing on the fashion and apparel industry, over the last three years. We currently provide fabrics to the fashion industry which, scientifically proven, offers a significantly better alternative to conventionally coloured fabrics. The fashion industry is fragmented. the largest player in the world has a market share of 1,5%. The 35 largest companies have a joint share of less than 16%. On average, a small or medium sized apparel company is catered by 150 suppliers. An average sales cycle for a new project is roughly 6-12 months, and it takes significantly longer to start new customers. This implies that we are investing roughly 2 years in our team, before we can send the first invoice. This is enormously time and effort consuming and we need all the publicity we can get. Our message – the fact that there is a scalable and far more sustainable alternative out there, ready to be implemented is far from well-known. In the meantime we continue to invest in both marketing and sales to get our message out. Certainly financial stamina is required, as the capital intensive and margin-pressured world of textile production is not super interested to open up for new players! The absence of a standard (like CE marking) is also making compliance very hazy and sometimes costly, as we are faced with private initiatives and certifications (like Blue-sign, Öko-tex etc).